Bats pollinate the world’s fruit producing plants and eat thousands of mosquitoes at night. 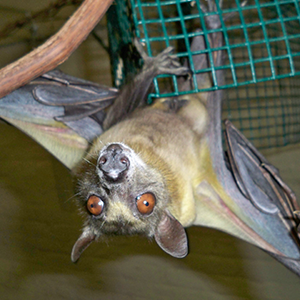 Bats are not blind, although some bats do use echolocation to find their insects and meals. A mother bat can locate her pup by its scent and sound out of millions in a roost. Bats roost upside down, usually in large social groups, in caves, trees and man-made structures. All bats live on milk from birth up to six months of age. About 70 percent of all bats eat insects. Some bats eat fruit, nectar, fish and three species even eat blood. Some male bats sing to attract a mate. Females only have one baby, called a pup, per year, although some species may have twins or quadruplets.